While nations are struggling to feed their starving people pushing U.S. corn export to record profits... supplies run short as food prices boom. For the first time ever, more of the corn crop may go into gas tanks than into the stomachs of cattle and poultry destined for kitchen tables. The prediction drew little response last week when it was released by the USDA in its Crop Production and Supply/Demand Report for the 2011 crop season. The USDA kept its prediction for ethanol production demand for corn at 5.05 billion, but lowered demand projections for livestock feed by 100 million bushels to 5 billion bushels. That fuel now tops livestock as the primary user of corn struck at least one observer as noteworthy. “That’s a first-time-ever type of change,” University of Missouri Extension economist Ron Plain said in a statement released by the university. The news comes as criticism that pro-ethanol subsidies and policies are raising food prices globally seems to be reaching a crescendo. Critics didn’t seem to latch onto the USDA’s market prediction, however. 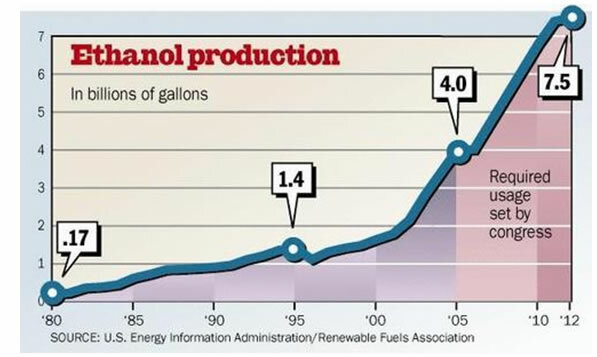 The USDA Thursday lowered its soybean and corn harvest estimates for the 2011 crop significantly and said ethanol plans will consume more corn than livestock. This year’s corn crop will be down 556 million bushels, or 4 percent less than projected in July, according to the Crop Production and Supply/Demand Report. Soybean yields will be 169 million bushels, or 5.24 percent lower than the July estimate of 3.225 billion bushels, the report indicated. A primary reason for the shift in grain demand away from livestock is the thinning of herds and flocks in order to reduce red ink and improve prices for producers, University of Missouri Extension said in a statement released Thursday. Plain said yield estimates were cut due in part to excessive heat in July, flooding, and other weather events. He said corn does not grow as well when temperatures at night remain high. The USDA projected that carryover stocks of corn will drop to 714 million bushels, a level last not seen since 1996. 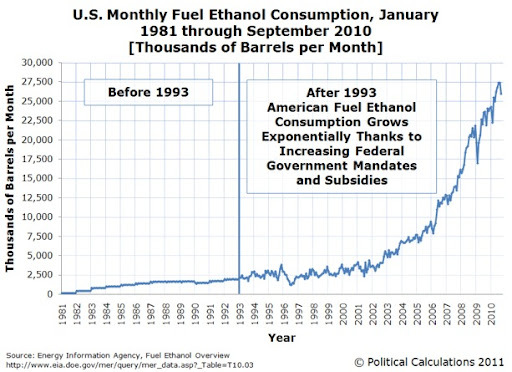 If Al Gore Can Outgrow the Ethanol Fad, Why Can’t Conservatives? 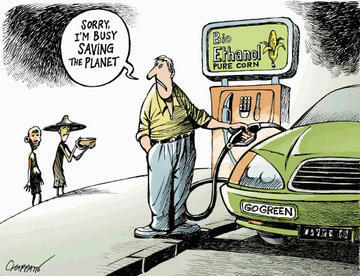 Ethanol Still a good idea when we can't feed 50 Million Americans?